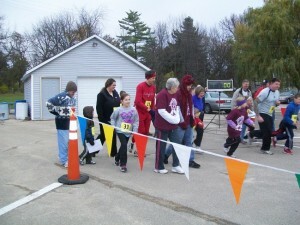 Home » Blog » Fitness » Running » A record breaking weekend – 5K Race! A record breaking weekend – 5K Race! This past weekend was another 5K race! Not only was it my first race of this year, but it was my daughter’s first EVER race! It had taken a little convincing to get her to enter – mostly because she was unsure that she could do well. But we told her: no matter what, just have fun! That’s what its about. Trying new things, having a good time – and getting exercise while you do it! 🙂 This race was particularly nice, because it is very small. And because it was small, there was a very good chance she would place in her age group and get a medal. A big motivator for a 10 yr old! She did great! I’m so proud of her! Next up, Dave and I ran the 5K portion. This was my first time running this race, and Dave’s 3rd. I have been doing my training runs on flat ground and this course has two hills ~ 1 long one and 1 steep one. Killer! Despite it all, though, I finished strong and knocked my old PR out of the water by 1 min 33 sec!